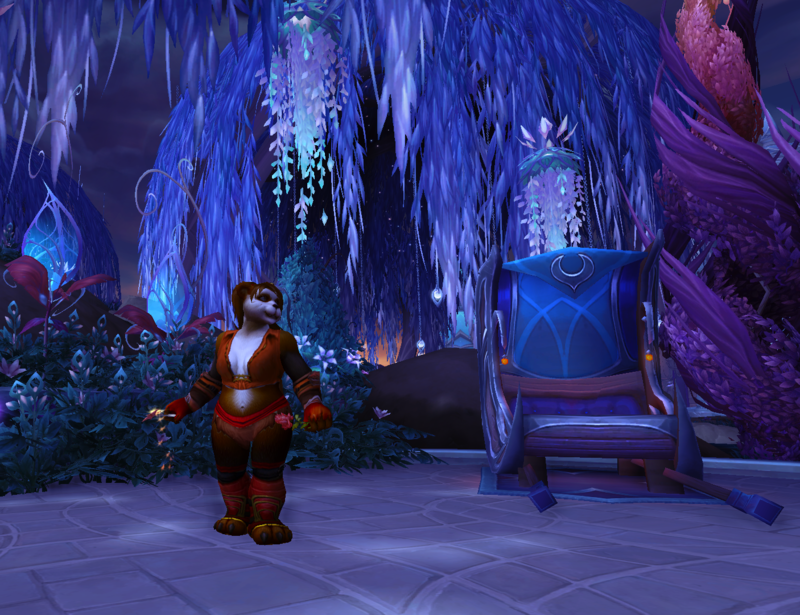 WoWable has a fun new thing going on: a transmog contest! This edition’s theme is the Love Is in the Air, an in-game version of Valentine’s Day. The stars in the under-canopies alone made me love the City. And as if that’s not enough, Suramar City has so much more to offer: interesting buildings and streets, parks, intricate textiles, little squares, shops and residences, plus canals and gondolas. It’s an intriguing place to wander around, but the rotating (did I say already that they rotate?!) starfield canopies made the City go to the top of my romantic places list. My screencap is from a small area in the outer rim of the City in the south west. (I haven’t noticed whether it has a name. It’s an outer edge of the Lunastre Estate.) It’s not a park or garden or anything fancy, just a widening of the promenade. However, it happened to have the right combination of elements that appeal to me: the gorgeous Suramar paving stones, lots of flowerbeds and bushes, those plants that look like ornate lanterns, hovering planters, the trees with the rotating star canopies, and a sunset (as it happened) in the background, as well as palanquins that look just right for two people to have a ride in. Just perfect for a mage moonlighting as a singing telegram for the holiday to stop and rest in between delivering messages and flowers. Check out the rules and how-to at WoWable. That is a wonderful spot you found there. Suramar is so breathtakingly beautiful. The transmog is very adorable, I was tempted to chose that colour too 🙂 Sweet! Thanks! I love all of Suramar. Sometimes the colors can be a little intense (the orange and rust red trees) or dim (the City) but all of the design is fabulous. Awesome! I like how you picked a “normal” place on the lovely city of Suramar (which is lovely everywhere) and just noticed the small little things . Thank you for your entry!